The number of plant and tree species in Finnish forests is small compared to the boreal zone in North America, or the temperate zone in Central Europe. This is because of the high European mountain ranges running east-west, which prevented the return of plants to the north after the last Ice Age about 10 000 years ago. There are only four coniferous tree species native to Finland, and fewer than 30 deciduous trees and arborescent shrubs. The majority of forests in Finland are predominantly coniferous forests, with broadleaved species often growing in mixed stands. Mixed forest stands and predominance of broadleaves are common in mineral soil sites and upland forests with grass-herb vegetation. 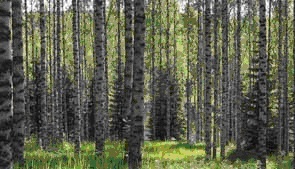 The most common species growing in mixed stands is downy birch. Scots pine predominates on 67% of forest land, spruce on 22% and broadleaves on 11%. Broadleaves, which are important to forest biodiversity and soil, grow mostly in mixed stands. Their growing stock volume accounts for 20% of the total volume, which is clearly more than the volume of predominantly deciduous stands. Finnish birch forest. Photo: Metla/Erkki Oksanen. Moose (Alces alces). Photo: Metla/Erkki Oksanen. Several carnivores can be found in Finland’s forests such as brown bear, wolf, lynx and wolverine. 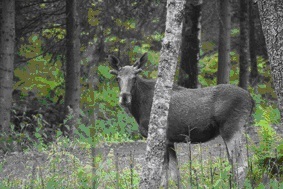 Game and reindeer management in Finland is practiced within the limits permitted by the sustainable use of natural resources. The most common game animals are elk, hare, grouse and water fowl. The authorities and local game management associations in Finland set the framework for the management and various uses of the game’s habitat.